Time to put on the red tie one more time. Agent 47 is in a bad situation. He's the object of a city-wide manhunt in Chicago, and a small army of cops has cornered him in a derelict library. He's on the run, and doesn't have any of his usual tools or weapons with him. He'll have to draw on his experience and his killer instinct if he's going to survive. So begins the demo for Hitman: Absolution, which showcased what Agent 47 can do with whatever happens to be at hand. Sneaking around the stacks of books, he performed several stealth takedowns by choking out police officers with his bare hands and a power cord that happened to be lying around. A cop standing too close to a hole in the floor fell prey to a statue to the face; a colleague on al edge above him followed after Agent 47 grabbed his ankle and pulled him over the edge. As fun as it always is to watch Agent 47 do his thing, sneaking and quietly taking out enemies is a regular staple of the Hitman universe, so the demo moved on to pointing out something new: Agent 47's Instinct abilities. The Premonition skill traces a firey line on the floor, indicating where enemies are likely to move; it also highlights the location of items of interest, such as climbable ledges. He an also Act and Hide in order to better blend in with his environment once he's in disguise. Using any of these skills burns through Agent 47's Instinct meter, however, so the abilities have to be used sparingly and wisely. "Freedom of choice" is a core philosophy at the heart of the game's design, and we did see Agent 47 pursue a number of different strategies while evading his police pursuers. He grabbed one and used him as a human shield, sabotaged a fuse box to create confusion, moved swiftly from cover to cover to avoid gunfire from a hovering helicopter, and hid in plain sight by grabbing a donut after donning a downed officer's uniform. Absolution is a very good-looking game, with great detail, lighting, and animation. The demo we saw showed off what we love about Agent 47, but only scratched the surface of some of the improvements that are being promised, such as the "living, breathing world" populated by more nuanced AI. The developers were also very stingy with extra information about that game, preferring to stay tight-lipped about most aspects of the game. That said, what we saw certainly rang true as a Hitman game, and the new Instinct skills hint at strategies that can add a new layer of complexity to Agent 47's missions. 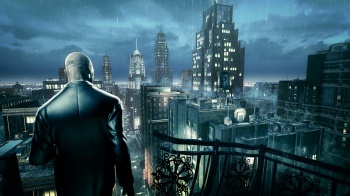 Hitman: Absolution will be out on Xbox 360, PS3 and PC next year.